作者: Amiira Ismail on 24 January , 2017. Jeong Ji-Su is a 22-year-old designer based in Seoul. His clothing design name is Albinism Closet, which captured my attention immediately when I heard it. The reason some of you know (or may not know) that albinism is an inherited genetic condition that reduces the amount of melanin pigment formed in the skin, hair and/or eyes. So, when I heard the brand name I quickly became intrigued and was curious of whether the name was actually related to the actual genetic condition and I have come to find out it was. 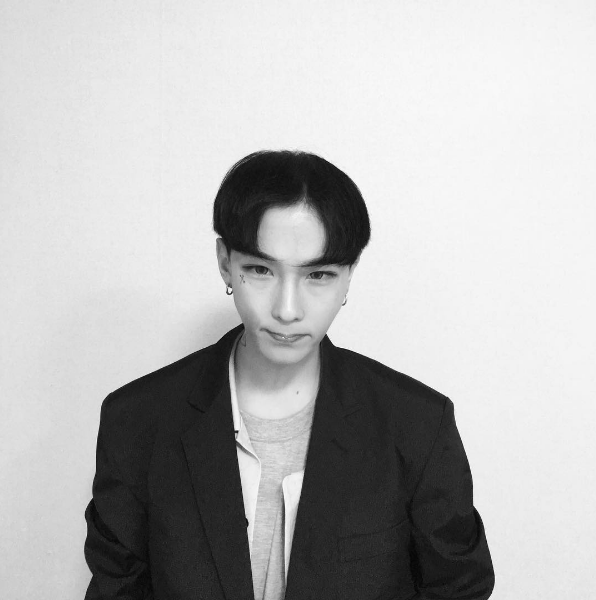 In this exclusive interview for The AsiaN, Ji-Su tells us about the origin of his brand concept, his favorite things to do as well as his future plans for his future career goals. Hello! Please introduce yourself. How old are you? Where are you from? Hello, my name is Jung Su-ji, I am 22 years old and am from Jejudo. I would like to know how you fell into the fashion culture and designing clothes. Was it a childhood dream for you or something you fell into? Since I was young I drew illustrations, and while I was drawing a particular fashion illustration, I realized that my design style and what I enjoyed illustrating went well together. Can you tell me why you chose the name albinism closet? 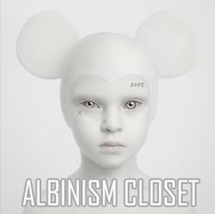 Because you can’t keep on creating things just about albinism (melanin pigment deficiency), I decided to include all other extra aspects related to albinism as part of my brand concept and so I named it the “Albinism Closet”. Why are you captivated with albinism? At first I was just very interested in albinism itself and even shot a look book about the topic. I loved that the smallest of details were all in white and so I decided to make it a motif of my brand. I remember dressing myself in white tones at that time and being called a vampire because of my style! Can you tell about your go to clothes and your usual style? Because of my many tattoos, I tend not to dress in street fashion as it makes me look too flashy. I usually wear work-wear or easy-wear plus the office look that I designed myself. Sometimes, if it is for an important occasion, I like to dress in 70s and 80s European old-gentleman fashion—for instance, I really like the fedora. What’s the hardest thing in designing? First of all, I have to be able to do everything myself. I need to become the owner of my independent brand. So tell me about Albinism Closet design, the concept, design etc. I dye fabric into colors that match the concept of Abinism Closet, which mainly is in white and gray shades. It depends every time, but since this particular look is based on the restroom concept (albinism+plants), green is the accent color (greenery). Other brands seem to get their inspiration from abstract concepts, but my inspiration usually comes from things like buildings and animals and it is easy to grasp the concept by just looking at the designs. I prefer simple designs with good sense. Marc Jacobs because I respect and admire the way he works, his lifestyle, personality, and almost everything about him. What is your favorite aspect about working in the industry? Because it is art, it is also free and you can do different collaborations with other designers. This time around I collaborated with Sugarcraft. If you weren’t’t in the designing industry what do you think you would be doing? If I hadn’t entered the world of fashion, I probably would be working as an illustrator. What are your favorite places to hang out at during your free time? I take walks with my dog and have fun at home! And what do you hope for albinism closet in the future? I hope that my brand would be introduced not only to the Korean market but also to other countries, and I also hope that people would come to see Albinism as something beautiful and not as a symptom, and that these things are all part of what makes people unique in their own right. I highly recommend everyone to be on the look-out for what is coming up next for Albinism Closet and support his brand! You can follow his brand at instagram @albinism_closet for additional information as well as stay up-to-date on his up and coming activities. Down below you can also check out some of my favorite looks from Albinism Closet. Let us know in the comment section below what you think about his concept and designs. illogical explaination, Being Albino has Nothing to do with your Cool brand, it can’t Direct you to make your own Clothes Either. so I’d like you to explain to us What exactly made you think Albino could be Cool, and What correlation Between Your Grey-White look and Albino.